Fashion a bedroom that's as cool as they are with the Summit Twin Bedroom 3-Piece Set in Dark Chocolate from Delta Children! 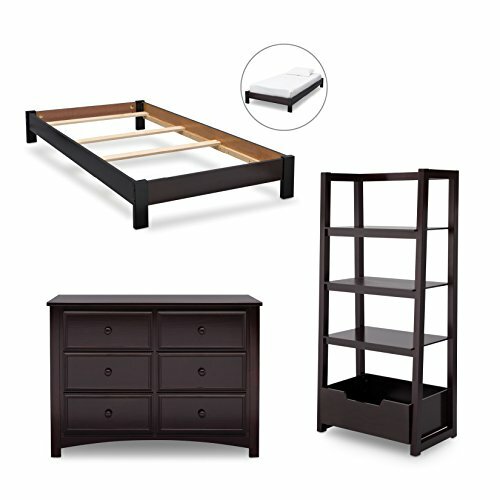 3-Piece Set: Brimming with style and versatility, this set includes a Twin Platform Bed, a spacious 6-Drawer Dresser and a sleek Ladder Shelf for additional storage. The Twin Platform Bed features block feet, and is designed to function as a standalone twin platform bed or can be paired with select twin headboards from Delta Children (sold separately). The 6-Drawer Dresser is easy to use, since the ball-bearing, side-mounted drawer guides glide smoothly. The dresser also includes extra features that ensure your child's wellbeing, safety stops prevent the drawers from falling out, and it comes with an anti-tip kit, so you can safely secure the dresser to the wall. The Ladder Shelf helps add function and style to your child's space, it features a modern, A-line profile, three shelves that increase in size and a spacious bin at the bottom, perfect for storing books, toys and more. The perfect addition to any girls room or boys room, the Summit Twin Bedroom 3-Piece Set makes it easy to give your child a complete room upgrade that they'll love. About Delta Children: Delta Children was founded around the idea of making safe, high-quality children's furniture affordable for all families. They know there's nothing more important than safety when it comes your child's space. That's why all Delta Children products are built with long-lasing materials to ensure they stand up to years of jumping and playing. Plus, they are rigorously tested to meet or exceed all industry safety standards. Enjoy Free shipping. For your convenience the trucking company will personally contact you to select a date and time that suits your schedule best.